To purchase the CD/Book of Misterstourworm and the Kelpie's Gift, click the link below which takes you to the Circular Records Internet shop. 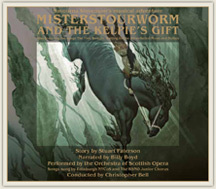 You can now purchase the digital version of Misterstourworm and the Kelpie's Gift, once purchased you can view it online 24 hours a day 7 days a week. There are a total of 36 pages. PLEASE NOTE: This online version is not a downloadable product. Once purchased you can view the book and listen to the music online 24 hours a day 7 days a week. If you would like to view a very small sample of what the digital edition looks like, please click here, NOTE: this is only a small portion of the actual product.